Anyone in Minnesota know that this winter seemed like it would last forever. We had blizzards in mid April, rain storms for weeks, and cold wind after that. Today the sun has come out of hiding and now we can all breathe a sigh of relief! Now that there is finally reassurance that spring is here I've been thinking of all the new outfit opportunities that spring brings. Hello skirts, shorts, sandals, and sunglasses! For a casual day walking around downtown, this jeans and tank combo. 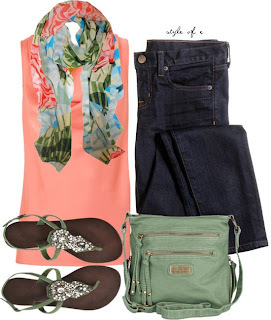 I love the bright scarf and embellished sandals. The purse is a cross body bag, super popular right now. But I love that it's in a non-traditional color. I see so many girls walking around campus with brown or black ones, this mint colored alternative would stand out in the crowd! I found this on polyvore, Spring Scarf by styleofe. I've been loving pale pinks lately, which is different for me since I'm not normally a pink girl. This is the perfect shade of pink in my opinion, not too loud, but not too soft. This outfit would be perfect for a date night, maybe dinner by the river? I love the suede heels, and I'm thinking they are wedges which means easy on the feet! 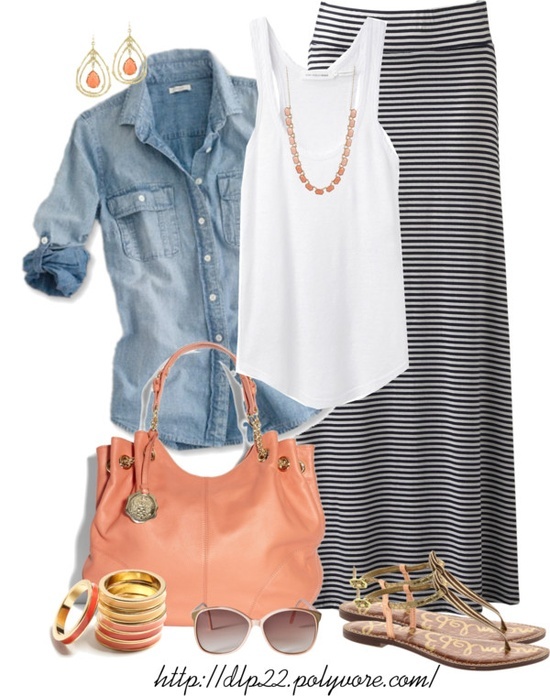 Also found on polyvore, Summer Dress Up by taytay-268. I've been looking for a way to wear a maxi dress/skirt in a way that looks relaxed and casual. I love the denim shirt and cotton maxi skirt combo here. I wouldn't wear the necklace with the tank top but everything else about this outfit screams first bonfire of the year! I love it. Casual, just warm enough for a breezy evening, and the bangle bracelets add a little something sparkly (: Once again found on polyvore, Untitled #172 by dlp22. Hopefully this gives you guys a little peek into my spring style inspiration!